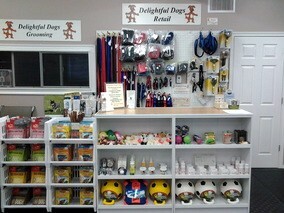 Welcome to the Delightful Dogs' Retail Store! Inside you'll find a variety of items all geared toward your loving canine, to help you throughout your classes and your daily adventures. We carry only top of the line items that are strong, sturdy & durable, and edibles containing only the highest quality of natural ingredients. From leashes, collars, treats, training aides and more, all our products have two key components in mind; Safety & Quality! *Note: ﻿Due to safety, liability and insurance policies, we do no sell any carting/sledding/skijoring/pulling harnesses. Feel free to bring your friendly dogs, as they are more than welcome to join in your shopping experience, helping you choose their favourite items.